Louvre Abu Dhabi exterior. Courtesy Mohamed Somji/Louvre Abu Dhabi. 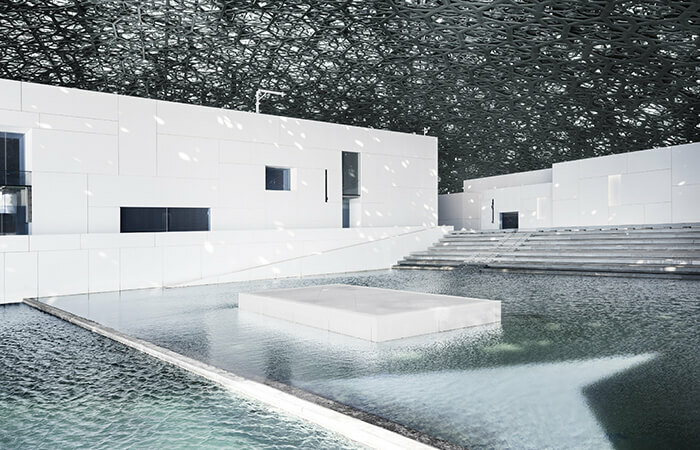 Louvre Abu Dhabi, announced in 2007 as part of an international agreement between Abu Dhabi and the French government, is now a reality. Located in a new cultural district just outside the historic city center, Louvre Abu Dhabi sets out to be the focal point of a conversation between civilizations and cultures. Opened on November 11, the silvery domed archipelago of buildings designed by architect Jean Nouvel rests on windswept promenades overlooking the sea at Saadiyat Island and brings the fruits of a cultural collaboration to a new audience of art lovers. “It presents an opportunity for world-class regional and international art to be displayed for the benefit of the Abu Dhabi citizens and visitors from across the globe, in a series of spaces that have dynamically reimagined the traditional museum experience,” says Neil Billett, global design director at BuroHappold Engineering, the firm retained by Abu Dhabi’s Tourism Development & Investment Company (TDIC) to provide all engineering services for the project. Louvre Abu Dhabi’s “rain of light,” in which shafts of light seem to fall from the sky. Courtesy Mohamed Somji/Louvre Abu Dhabi. The artwork, much of it on loan from the Louvre in Paris or acquisitioned by the Agence France-Muséums, ranges from the ancient to the modern: Besides artifacts and paintings from the Middle East, visitors can view works by Gauguin, Picasso, and Bellini. The opening exhibit features works from other international museum collections, furthering the institution’s goal to become the first “universal” museum, one that tells the story of global civilization. According to Andy Pottinger, a structural engineer and associate director at BuroHappold, the museum is the first realized project of several envisioned by the TDIC for Saadiyat (translation: Happiness) Island, including the Zayed National Museum and a Frank Gehry–designed Guggenheim contemporary art museum. 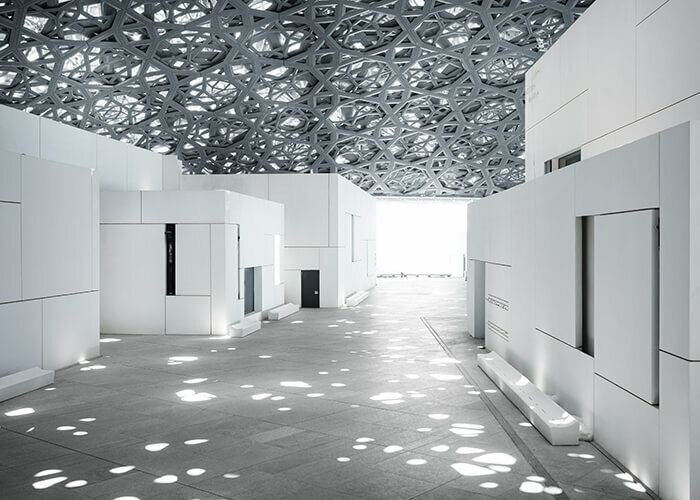 Pottinger says realizing Ateliers Jean Nouvel’s dream for Louvre Abu Dhabi—particularly the celestial profusion of light emanating through its dome—required shrewd, instinctive engineering and creative use of iterative BIM. An initial leap forward, he says, was changing the support for the dome from five perimeter pillars to four, and then the “eureka moment” came when changing the steel pattern to merge with the complex, eight-layered cladding pattern in tune with the architect’s vision. 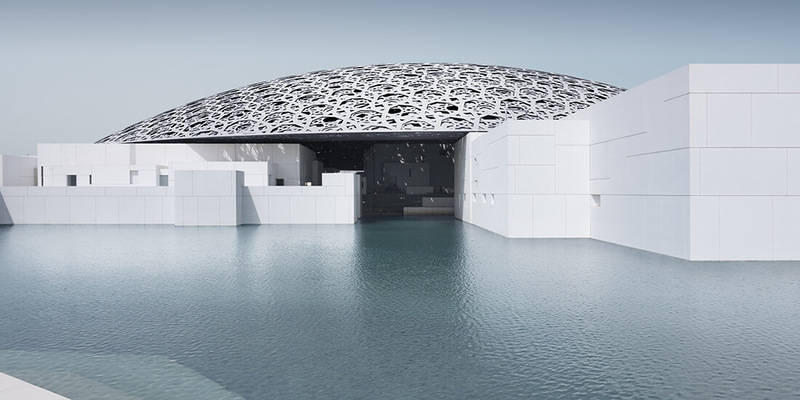 Water extends into Louvre Abu Dhabi’s plaza. Courtesy Mohamed Somji/Louvre Abu Dhabi. The dome’s tapestry of 7,850 “stars,” based on scaled and rotated versions of its steelwork, creates the perception of randomness from geometrically logical patterns. The structure itself becomes an integral part of Nouvel’s “rain-of-light” effect, in which shafts of light seem to fall from the sky. The light manifests in a softer radiance above the galleries and greater luminescence in the open plaza, café, and restaurant. Ensuring the strength of the 7,500-ton dome required imposing a clear rule set, along with a bit of software wizardry. 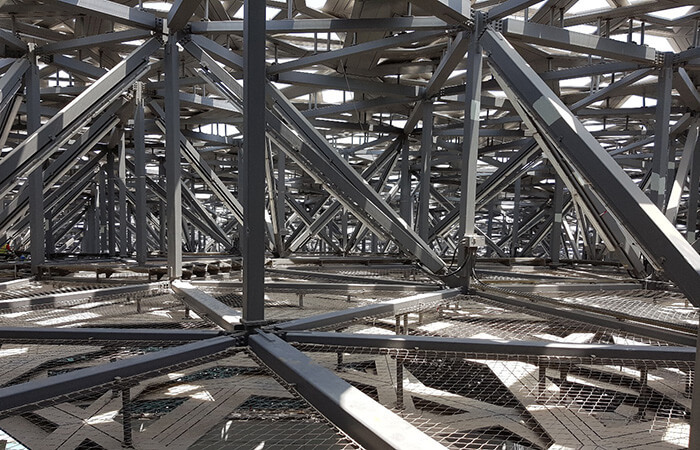 After running strength-optimization tests using tools such as Autodesk Robot Structural Analysis Professional, Pottinger’s team linked the dome’s final geometry to Revit to generate drawings showing the size of each individual component—all 11,000 of them. The Austrian company Waagner-Biro managed a complex construction sequence, which spanned five years and required the installation of 120 temporary towers. 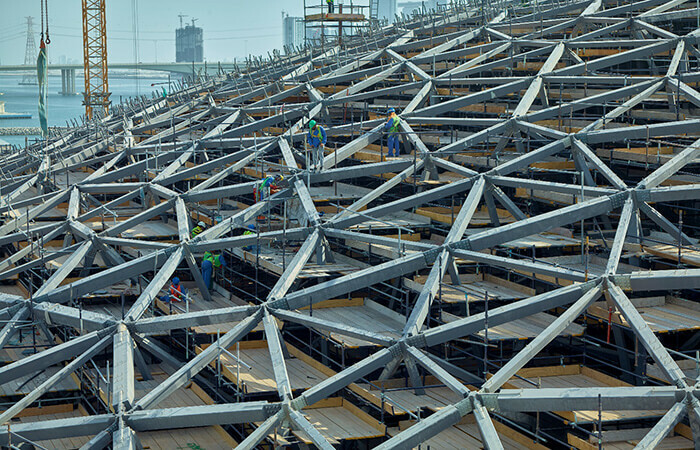 Louvre Abu Dhabi’s dome roof, under construction. Courtesy BuroHappold Engineering. “When I walked around the building, in advance of it opening, I could remember going around the model in the same location. It’s like computer gaming, a virtual world, until you walk into it and it becomes real,” Pottinger says. If the dome stands as an engineering feat of the highest order, the galleries and exhibition halls are impressive in their own right, laid out in an arrangement recalling a traditional Arabian souk. The village-like superstructure of more than 40 detached buildings appear to float, but in truth are supported by some 4,500 concrete and steel piles founded in bedrock 11 meters beneath the waterline. Climate control was another important consideration. In Abu Dhabi, daytime temperatures can exceed 104 degrees Fahrenheit, and airborne dust and salt pose threats to the artwork—and visitors’ comfort. The shading of the dome, along with a discreet, tightly integrated and efficient close-control system, Billett says, keeps the humidity at 50 percent, plus or minus 5 percent, and the indoor temperature remains within a half-degree of 70 degrees Fahrenheit within the gallery pavilions. Detail of layered view inside dome roof. Courtesy BuroHappold Engineering.